Guan Saw's research relates to STEM education for underserved and underrepresented groups. 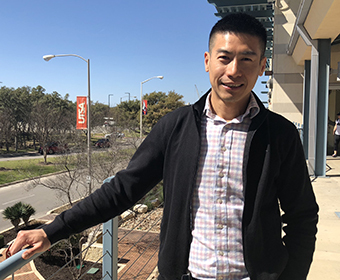 (March 27, 2018) -- Guan Saw, assistant professor in the UTSA Department of Educational Psychology within the College of Education and Human Development, is conducting research related to science, technology, engineering and mathematics (STEM) education for underserved and underrepresented groups. A first-generation faculty member, his goal is to advance knowledge and inform policymakers and educators on the best practices for preparing students for careers in STEM-related fields. >> Learn more about UTSA's first-generation family. We asked Saw to share more with us about his research. Talk about the project you’re currently most excited to be working on. I’m currently most excited to be working on two research projects related to STEM education and school-to-work transitions. My first project is teaming up with the UTSA Institute for P-20 Initiatives to study the impact of the Prefreshman Engineering Program (PREP) on high school, postsecondary and labor market outcomes. PREP was founded at UTSA in 1979 and it is now one of the oldest and largest STEM summer programs in the nation. It is designed to prepare middle and high school students, especially women, Blacks/Hispanics (underrepresented racial minorities) and potential first-generation college-goers for success in advanced studies leading to careers in STEM. My second project is partnering with a number of faculty and doctoral students at UTSA, Texas A&M University and the University of Texas at Austin to analyze the most recent nationally representative High School Longitudinal Study of 2009 (HSLS:09), conducted by the National Center for Education Statistics. Collectively, our research addresses two contemporary educational disparity issues: college preparation and access for underserved students (such as students with disabilities, first-generation college-goers, and bilingual children) and STEM preparation and participation of underrepresented students (including women, Blacks/Hispanics, and low-socioeconomic status youth). Some of our manuscripts are now under review or have been accepted for publication by high-impact academic journals. Aligning well with UTSA’s mission, my research aims to advance knowledge and the evidence base for improving education and workforce preparation, especially among historically underserved and underrepresented students. The above two projects contribute to this goal in different ways. The PREP project is a partnership between researchers and practitioners such that the research findings are important and relevant to research, policy and practice at the local and state level. The High School Longitudinal Study of 2009 fosters a robust research community that can conduct rigorous studies for testing research hypotheses large-scale data and informing educational debates at the national level. My research, teaching, and service are informed by my experience as a first-generation college student with three degrees, including STEM and non-STEM majors, completed in three different countries (Malaysia, Taiwan, and the United States) and languages (Malay, Mandarin, and English). Prior to becoming a faculty member at UTSA, I had worked as a high school vice principal and math teacher in a low-income rural area in Malaysia, a department director in the largest non-profit educational organization in Malaysia, and a graduate research assistant at universities in both Taiwan and the U.S.
My cross-national, cross-cultural schooling and working experience makes me constantly eager to gain new knowledge, to play with new ideas from different perspectives, and to pursue research work that can have a societal impact at the local, state, national, and international level. What advice do you typically share with to your students? Read. Read. Read. A great researcher is a great thinker, and a greater thinker is a great reader. Learn more about Department of Educational Psychology.